There aren’t many pieces to deal with, so learning to put together your saxophone is relatively simple. Place the neck strap around your neck. Make sure your strap fits well. Grease the cork with your cork grease and then put the mouthpiece onto the gooseneck. Place the flat side of the reed on the mouthpiece and then carefully slide the ligature over the top and tighten. Twist the gooseneck onto body, then tighten the neck screw. Clip your strap onto the neck strap ring. Always support the weight of your saxophone from the bell – never hold it from the gooseneck and never let it swing from the strap! From Mussorgsky to Rachmaninoff, Coltrane to Stan Getz, the saxophone is a unique instrument. It was a late addition to the family of acoustic instruments, finding it’s most soulful sounds in the world of jazz and popular American music. The saxophone has chameleon-like qualities, making it not only versatile but intrinsic to popular and contemporary music. 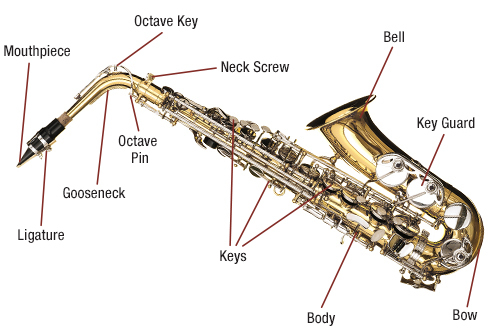 What type of saxophone does my child need? The Saxophone you will start on will be an E-Flat Alto Saxophone. Some brands and models that are perfect for students starting out are: Yamaha YAS280 and YAS26 (there is no high F# on this model), Jupiter 769 and Buffet 100.